San Francisco has gone mad over Shanghai, and for good reason. Shanghai is one of the hottest destinations in the world this year, what with its enormous Expo 2010 slated to be the largest World's Fair in the history of humankind. Why does San Francisco care? Because San Francisco and Shanghai are sister cities, and have been for a long, long time – since 1980, to be exact. You may think 1980 is not so long ago, but let me remind you that in 1980 it had only been 8 years since Richard Nixon first visited a place called Peking, Diane Feinstein was still mayor of The City, and the PC, WiFi, and the iPod were merely embryonic concepts, if concepts at all. San Francisco and Shanghai have been sister cities for a long, long time. So, this is Shanghai's year, and like any good sister, San Francisco wants to get in on the action. Shanghai's leadership expects that 70 million people (!!) will come to Expo 2010 between May 1st and October 31st of this year. San Francisco's leadership suspects that not quite as many people will be visiting their jewel-like metropolis in 2010, but for those who do visit – San Francisco will be all about Shanghai! 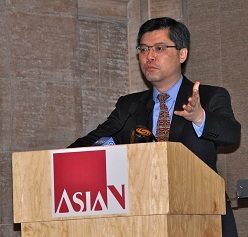 In January of this year, a Big Press Event was held at the Asian Art Museum on Larkin Street in San Francisco. Not only is this museum a divinely relaunched edifice, formerly the City Library, and houses one of the greatest collections of Asian Art in North America (however you define Asian), it also faces its gleaming neighbor across the plaza, the enormous and stately San Francisco City Hall. Given the proximity of these two buildings, the museum and the city hall, it's not surprising that San Francisco Mayor Gavin Newsom was inspired to be on hand for the Big Press Event in January at the Asian. 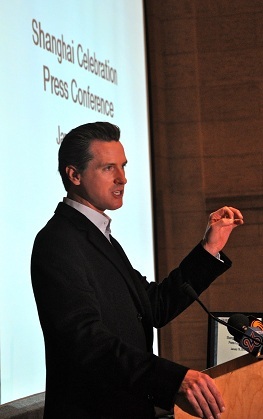 Newsom kicked off the morning's program by welcoming the 100+ members of the press and reminding everyone that the Sister City Relationship between San Francisco and Shanghai was the first such relationship established between any American city and any city in the PRC. After the charming Mayor was done with his remarks, the equally charming Asian Art Museum Director Dr. Jay Xu, official host of the Big Press Event, introduced each of the remaining speakers. Representatives from a host of cultural organizations across The City described a set of events taking place in 2010 worthy of any World Expo. The San Francisco Symphony, the San Francisco Conservatory of Music in partnership with the Shanghai Conservatory of Music, the San Francisco Ballet, the San Francisco Arts Commission, the San Francisco Botanical Garden, the American Jewish Committee (the Jewish ghetto in Shanghai was protected by the local population there during the occupation in WWII), the San Francisco Planning and Urban Research Center, the South of Market Arts Cultural Center, and the San Francisco Public Library were all showcased during the morning's program. These 9 organizations and their various events are only the tip of the iceberg, however. Over 30 cultural organizations in San Francisco will be hosting more than 50 events over the course of 2010, all celebrating Sister City Shanghai. If you're only going to sample one of the cross-cultural offerings in The City this year, make it the Shanghai Exhibition at the Asian Art Museum, mounted in association with the Shanghai International Culture Association. Opened officially in February, this show will be in place until September 5th, and is completely captivating. It consists of a mix of offerings – photography, painting, works in neon and ink, video, furniture, fashion, architecture, and installation art – all representing the artistic life of Shanghai. If you are at all interested in history, modern politics, technology as a global enterprise, and/or the arts – you have to come to San Francisco and visit the Asian Art Museum between now and early September. You just have to. Do you need more? Well, there's one more thing. This is the Year of the Tiger and as you all know, San Francisco celebrates Chinese New Year in a big way. The Honorary Marshal for this year's Chinese New Year's Parade in February was none other than the Director of the Asian Art Museum, Dr. Jay Xu. How many cities invite the director of one of their art museums to serve as Honorary Marshall of one of the major tourist events of the year? San Francisco's a very special city – and this year in particular, so is Shanghai. So come celebrate 2010 - it's the 30th Anniversary of the Sister City Relationship between Shanghai and San Francisco, it's the 150th Anniversary of the founding of The City & County of San Francisco, it's the year of Expo 2010 in Shanghai, and it can be your year to learn everything about two great cities. The Pacific Ocean is the largest body of water on the planet. After you visit the Asian Art Museum and see San Francisco's glamorous nod to the History and People of Shanghai, you'll see that the Pacific is perhaps just a beautiful lake with two equally beautiful sister cities facing each other from opposite shores. * Thanks to accomplished photographer Alexander M. Kallis for the photos of Mayor Newsom and Dr. Xu included in this article.